By Dan Ambrose: Light welterweight contender Adrien Broner (30-2, 22 KOs) revealed on the Bounce TV Premier Boxing Champions card featuring Rau’shee Warren vs. Carlos Payano fight that he’ll be fighting on October 3rd. Broner wasn’t willing to say who he plans on fighting next, but it wouldn’t be a surprise if it was a tune-up guy to help Broner boost his confidence after his recent 12 round decision loss to Shawn Porter last June. Before the loss to Porter, Broner had wins over three tune-up level opponents following his 12 round decision loss to Marcos Maidana in 2013. After those three fights, it was thought that Broner had improved enough to beat a fighter in Porter’s class, but he clearly wasn’t on his level both mentally and physically. One fighter whose name has been mentioned as a possible opponent for Broner is Ruslan Provodnikov. His name is merely a rumor though, and it would be very surprising if that’s who we actually see Broner fight. I doubt that Provodnikov will get the fight through, because he’s too much like Maidana and Porter for him to be picked out for Broner after a disappointing loss like the one he just experienced. It’s more likely that we’ll see Broner face someone along the lines of Luis Collazo or Chris Algieri. Those guys are good B-level fighters that Broner should be able to defeat without any problems. But if Algieri looks as good as he recently did against Amir Khan in almost beating him, it might be a mistake for Broner’s adviser Al Haymon to select him for his next fight. Algieri really bulked up for the Khan fight and changed his fighting style completely in taking the fight to Khan. Broner’s fight on October 3rd will likely be televised on Showtime. The bad thing about Broner fighting on October 3rd is that he’ll be competing with an important fight on HBO Championship Boxing on the same night between Lucas Matthysse and unbeaten Viktor Postol. Those two fighters will be battling over the vacant WBC light welterweight title that was recently stripped from former WBC champion Danny Garcia for his failure to defend the belt in over year during a time he was fighting catch-weight fights. Broner will need to fight a high quality opponent for his Showtime fight to bring in good ratings. If they do get Provodnikov, then there are no worries about them losing ratings to the Matthysse-Postol fight. But if Broner is matched up against Carlos Molina or Emmanuel Taylor again in another attempt to bolster Broner’s confidence, then he’s going to wind up with terrible ratings. Broner needs to fix his game in a major way before he starts facing the top tier opposition at 140 and 147. He’s been using Floyd Mayweather Jr’s fighting style for so long, and it’s pretty obvious that the style doesn’t work for him in the 140 and 147lb divisions. It worked at super featherweight and lightweight, because he had too much size and power for guys in those two weight classes. But light welterweight and welterweight, Broner needs to learn to throw a lot more punches and be much more aggressive for him to continue to win. The guy that Broner needs to be copying now is Marcos Maidana rather than Mayweather. 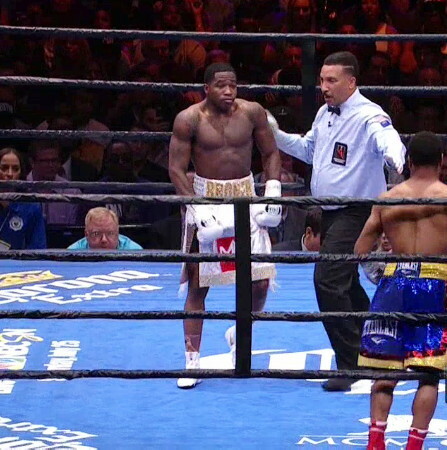 As we saw in the 12th round in Broner’s last fight against Shawn Porter, he’s very good when he’s attacking his opponents all out and throwing a lot of heavy punches in a nonstop attack. Broner is hard to beat when he’s throwing a lot of shots Now if he can just unlearn the pot shot style of Mayweather and pattern his offense after Maidana, he might turn out to be a very good fighter.